This webinar has been approved for 1.0 AICP CM credit. Even after two and a half years, many of New Jersey’s coastal communities are still struggling to manage immediate post-Hurricane Sandy recovery and rebuilding efforts. 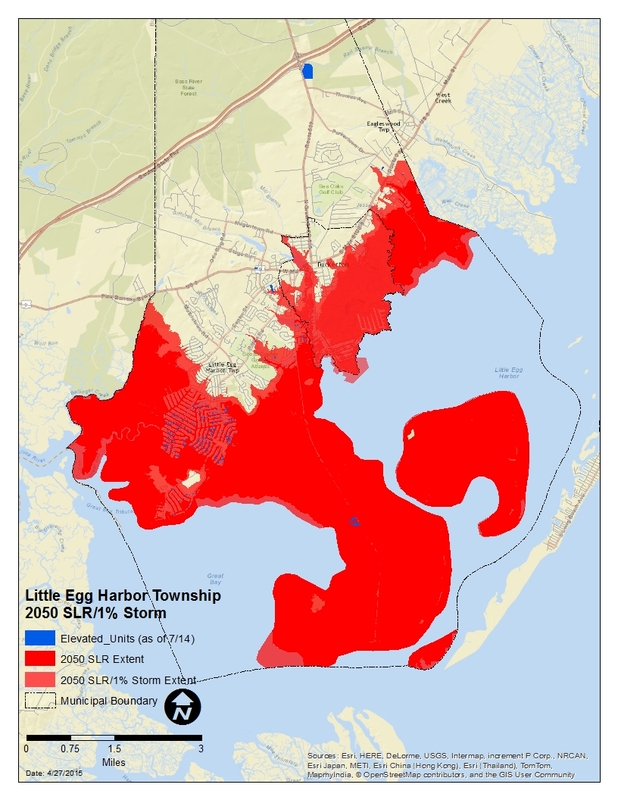 These towns face political pressure to rebuild as soon as possible, despite the growing realization that merely returning a community to its pre-storm state, coupled with sea level rise, will inevitably put more people and property in harm’s way. One of the first and most critical steps these communities must take to plan resilient adaptation strategies effectively is to develop a detailed assessment of their financial exposure to future flood inundation based on projections of sea level rise. This webinar introduces attendees to a fine-grained, parcel-based mapping analysis that is being used to predict depths of inundation; model the resulting structural damage; and calculate the per-parcel financial exposure. Parcel-level damage assessments are aggregated to determine a potential municipal tax revenue loss. This economic analysis of vulnerability serves to open the difficult but critical public policy discussion of the likely impacts of sea level rise. It also creates the basis for developing and prioritizing practical and effective recovery and adaptation strategies and provides a clear and coherent argument for reshaping coastal development patterns to avoid repetitive harm and losses. The webinar is being presented as part of the Brookings Institution’s Infrastructure Week. David manages New Jersey Future’s Local Recovery Planning Manager program, which provides direct, long-term planning assistance to municipalities seeking to rebuild from the devastating damage of Superstorm Sandy. David is a licensed professional planner with over 25 years of land use and environmental planning experience. He has worked as a planning consultant and held positions in local, county, and state planning agencies in New Jersey, Massachusetts, New York, Pennsylvania, and Florida. David’s work has included master planning; community design; neighborhood planning; downtown redevelopment planning; economic development; natural resource protection; and open space/recreation planning. Christiana is an ecologist and GIS Specialist at Princeton Hydro, LLC, an ecological and engineering consulting firm in New Jersey. Her degrees in ecology and environmental analysis – with focuses in ecological principles, toxicology, and quantitative analysis – offers her a unique perspective on how best to use the powerful capabilities of GIS within an environmental context. Christiana began her career at the NOAA Coastal Services Center where she worked side by side with coastal managers and participated in the development of decision support tools. At Princeton Hydro, Christiana participates extensively in watershed, lake and flood inundation studies where she assists in the completion of hydrology and hydraulic modeling, watershed delineations and characterizations, bathymetric mapping and the execution of GIS-based pollutant load and hydrologic budget analyses and modeling. Christiana further complements her career working as an adjunct professor at Rutgers University teaching GIS and Watershed Management.